Please pray for the repose of the soul of Fr. Seamus Kuebler OSA, Prim. Please pray for the repose of the soul of Rev. Seamus Kuebler OSA. Prim., who suffered from cancer and died on April 9, 2019. 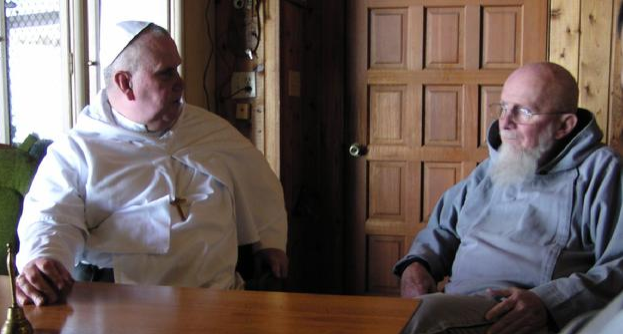 Father Kuebler (pictured on the left) led a monastery of the Augustinian Monks of the Primitive Observance in DeLand. He was born July 1, 1948 and raised in the Pocono Mountains of Pennsylvania. Legally blind since the age of 10, he became fluent in Braille. Father Kuebler was educated in Pennsylvania, and later at Kings College, Catholic University in Washington, D.C., and Notre Dame University. He was ordained a diocesan priest in Washington in 1975 by Cardinal William Baum. Father Kuebler was drawn to the cloistered life and had a professed dedication to praying for priests and to assist them in their service to others. While living in Massachusetts, Bishop Timothy Harrington of Worcester invited Father Kuebler to open a monastery in his diocese. In 2005, with the permission of Bishop Thomas Wenski, he relocated to DeLand where he established the Mother of Good Shepherd Monastery. “Monks live away from the world, their life one of prayer and contemplation, totally consecrated to God,” he said. A funeral Mass will be celebrated at St. Peter Catholic Church, 359 W New York Ave, DeLand on Monday, April 15 at 11:00 a.m.